These savory scones are – not to be too effusive, or anything – so addictively, amazingly, good that it’s ridiculous. I have to confess that I ate them for breakfast, lunch, and my late-afternoon snack on Monday. The cottage cheese adds a mild, creamy goodness while the colby-jack lends a bit of a sharp bite. The scallions are pungent, onion-y, and the perfect contrast with the cheese. Ensconced in a savory, buttery dough, the flavors are perfect. All the more so because this doesn’t include any butter (though, admittedly, a light smear of room temperature butter really takes these to the next level). The real key here is to handle the dough as little as possible. I turned it out as it was barely coming together and flattened it into a disc I was sure would fall apart at any moment. Consequently, these are crumbly and unbelievably tender. Combine flour, baking powder, and salt in a large bowl. 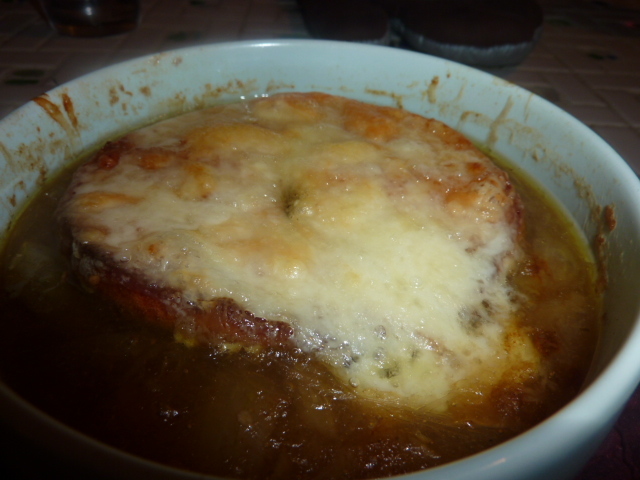 Add cheeses and gently combine with a fork. Add scallions and gently combine with the fork. Beat together the milk and egg. Using your hands, gently fold it into the flour mixture. When the dough just barely comes together, turn it out onto a lightly floured surface. Sprinkle with a bit more flour. Form into a disc about 1″ thick. Cut into 8 scone-shaped wedges. Spray a parchment paper lined baking sheet with nonstick cooking spray. I am currently desperate for ways to use up apples. I have about two dozen sitting on the table in our kitchen. These scones were an excellent way to make use of two of them. I stuck pretty close to the original recipe, here, because I don’t think I’ve ever made scones before and didn’t want to go too far out on a limb. I doubled the amount of shredded apple the recipe called for. As a consequence, these have a very pronounced apple flavor. 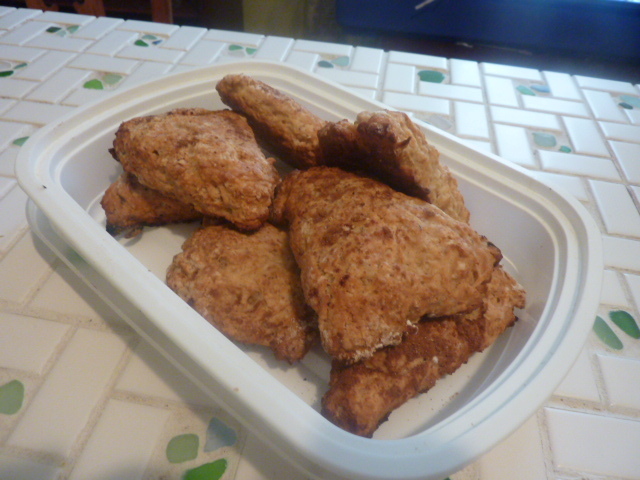 They turned out great – tender and crumbly. They were delicious warm out of the oven and I look forward to making use of them as an on-the-go breakfast snack drizzled with some honey. In the future, I would probably keep this as one bigger, thicker disc to make some larger scones. However, these are really great for snack time and were absolutely delicious. 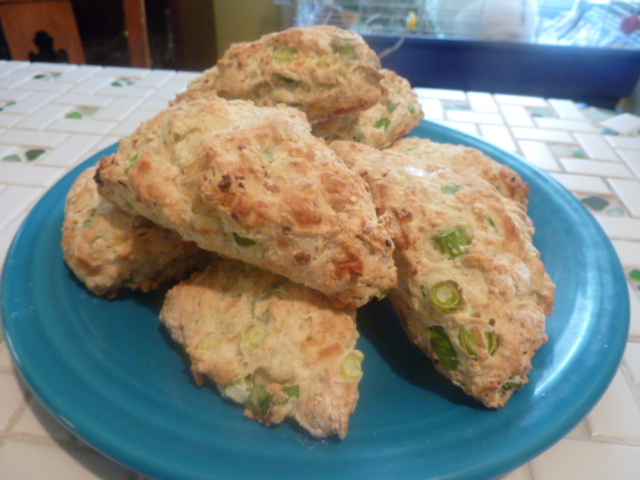 So delicious, in fact, I was inspired to make a savory scone version, which I will be posting in the near future. The idea to make scones reminded me of that one of my very early culinary inspirations were squirrels, mice, otters, and moles cooking up victory feasts. Whenever I hear the word scones, I think of the Redwall Series by Brian Jacques, which I was obsessed with as a girl. The woodland creatures were always holding feasts for all sorts of things, and scones of both the sweet and savory variety were a prominent menu item. I know I made several recipes I found on the internet way back in the day – back when it took several minutes of screeching and beeping followed by a “Welcome!” to connect to your favorite websites. There is, to this day, an entire website devoted to Redwall culinary delights – The Redwall Kitchen. I did not make use of the website with this particular recipe, though now that I am perusing the website I got some pretty good ideas. A bonus is that almost all of the recipes are vegetarian or pescatarian. Combine flour, sugar, baking powder, baking soda, and salt in a large bowl. Cut in butter until crumbly. Fold in shredded apple. Using your hands, slowly work in 1/2 cup milk. Combine by hand until it just comes together to form a soft dough. Turn dough out onto a lightly floured surface and knead a few times to combine. Pat into two 6″ circles about 1/2″ thick. Place on a parchment-lined baking sheet sprayed with nonstick. Brush tops with remaining 2 tbs. milk and sprinkle with sugar and cinnamon. Bake 15 minutes or until golden brown and puffy. I finally got around to making the Israeli couscous and vegetable mix I’d been talking about for weeks and weeks. While it was so good I was kicking myself for waiting, it was so good because it was paired with the gorgeous cod fillet Zak picked up at the grocery store – so I couldn’t really kick myself too hard. I breaded the cod in a tomato-bread breadcrumb, which tied everything together, as the Israeli couscous also contained tomatoes. The fish was crunchy, crispy, juicy, and delicious – an excellent companion to the soft, sweet, room temperature couscous and roasted vegetables. We both really, really loved this. Zak wanted me to go back and edit his top ten favorites from last year, but I told him there was always next year. He went back for seconds, and I am currently salivating thinking about the fixings I have for a crispy cod sandwich with some bread and butter pickles and a side of the couscous for lunch. In fact, this post is actually a two-for-one, because I included the link after the jump. Truth be told, I could have made an entire post about the delicious bread that made up the bread crumbs that coated this cod. The light tomato flavor was the perfect partner to the slightly smokey, slightly salty flavor of the proscuitto. The bread was a gorgeous reddish-pink color and perfectly soft and fluffy. It was excellent as a snack or a sandwich bread, so if you’re thinking about making this dish, I high recommend you include the tomato-breading, since you will definitely scarf the rest of the loaf. If not, I’m sure any old bread crumbs will do. Place flour, eggs, and bread crumbs on three separate plates or shallow bowls. Season all with kosher salt and freshly cracked black pepper. Coat cod fillets with flour, shaking off excess. Repeat with eggs. Roll in bread crumbs. Let sit at room temperature for about 30 minutes to allow mixture to set. Heat canola oil over medium-high heat in a cast iron pan. Add fish with like-size pieces and cook, without touching, about 3-4 minutes for smaller pieces and 5-6 minutes for larger pieces, until breading is golden brown and crispy. Flip and cook an equal amount of time on the other side. Work in batches to ensure even cooking, changing out oil if necessary. 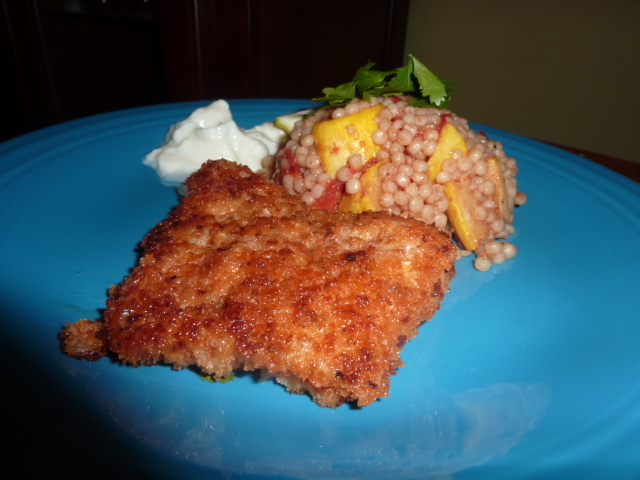 Serve with roasted vegetable Israeli couscous salad with plain Greek yogurt and cilantro. Cover a medium baking sheet with tinfoil. Toss squash and tomato with 2 tbs. olive oil, crushed red pepper flakes, salt, and pepper. Roast in oven about 30 minutes or until caramelized and cooked through. Meanwhile, bring chicken stock to a rolling boil in a medium saucepan. Add couscous, reduce heat to low, and cover. Cook about 8-10 minutes until stock is absorbed and couscous is cooked through. Toss together couscous and vegetables. Whisk together balsamic vinegar and remaining 2 tbs. olive oil. Season with kosher salt and freshly cracked black pepper and toss with couscous mixture. Let cool to room temperature. In a medium sauté pan, heat olive oil. Add proscuitto and cook until deep golden brown. Drain, reserving oil, and mince. Place reserved oil, proscuitto, crushed tomatoes, tomato paste, flour, gluten, salt, and proofed yeast in the bread machine pan. Set cycle to dough. Meanwhile, heat oven to 200º. Turn off heat. Spray bread pan with non-stick cooking spray. Place dough in the bread pan and let rise in oven for 45 minutes to an hour until it doubles in size. Remove from oven. Bake bread for 30 minutes. Let rest 10-15 minutes before slicing. Use about 3/4 of the loaf for any desired purpose. Use remaining end, preferably very slightly stale, to make breadcrumbs by pulsing in food processor until very fine. This jam is absolutely delicious. The strawberry flavor is unlike anything you’ve ever tasted in a store bought jam, I can guarantee you. It also has a hint of acid from the lemon juice and zest and a lovely amount of sweetness. 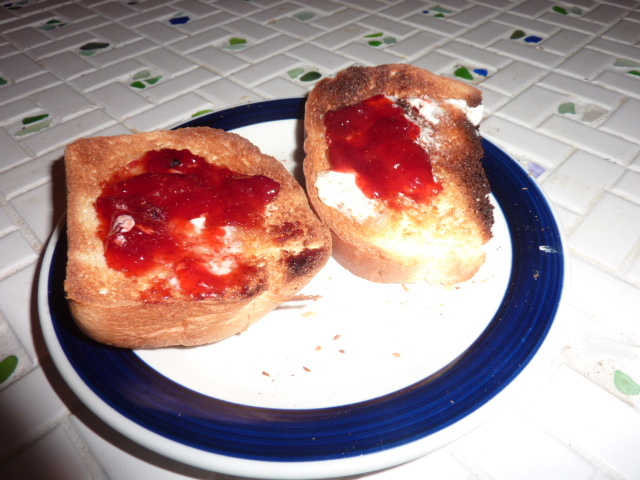 Served with a little bit of butter on some homemade bread, this made a wonderful snack or light breakfast. The bread was also incredibly good. It was light, fluffy, and incredibly flavorful. It worked equally well with both sweet and savory applications and the loaf disappeared much quicker than average for around here. I will say that I did not can this jam. I scaled the original recipe down quite a bit and knew we would make our way through it in about a week, so it would be fine to keep in the refrigerator, which we did. If you are interested in canning, there are about a bizillion tutorials out there on the internet to help you out. I’ve found this one to be particularly helpful. Combine sugar, lemon zest, and lemon juice in a small saucepan. Cook over very low heat, whisking frequently, for ten minutes or until sugar is dissolved and well incorporated. Add the strawberries and continue to cook over very low heat for 20-30 minutes, until strawberries release their juices and the mixture is slowly boiling. Continue to cook until jam sets on a very cold plate (keep it in the freezer). Place all ingredients in bread machine. Let knead one cycle. Remove from bread machine and transfer to lightly oiled bread pan. Let rise about an hour. Meanwhile, preheat oven 350º. Bake for 30 minutes. Let cool 15-20 minutes before slicing.